Kelly Tractor Co. knows the expenses you incur when your machine is down. That is why our Service Department is dedicated to providing the Best technicians and tooling available anywhere in South Florida. 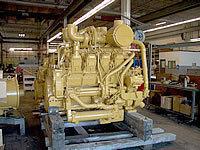 We are committed to keeping your equipment running. In an effort to stay focused on you, our customer, we have two separate Service Departments. One for Caterpillar Heavy Equipment and Link-Belt Cranes and one for lift trucks and utility equipment. In each Service Department we have technicians who specialize in specific products. We have full time service training instructors to keep all technicians up-to-date on servicing our complete product line including Caterpillar, Link-Belt, Caterpillar Lift Trucks, Barber Green, Taylor Lift Trucks, Massey Ferguson and much more. We also have invested heavily in state of the art diagnostic tools to help troubleshoot and repair your equipment. For any out-of-area customers, our Service and Parts Departments provide pick-up and delivery to Miami International Airport or to any freight forwarder in the Miami area of any component to be rebuilt in our shop or exchanged with any of our many Rebuild Exchange components in stock or in our Parts Department. Our shops perform highly technical rebuilds and repairs on the hydraulic components of the machines, rebuilds on pumps, motors, engines, and transmissions. A machine shop is present to salvage and fabricate parts for transmissions, brake drums, and hydraulic cylinders to minimize repair cost. The Transmission and Engine rebuild shop is responsible for insuring high quality work in engine, transmission and torque converter rebuilds. Full testing of rebuilt and repaired components is performed here on a regular basis, engines are dynamometer tested, and bench testing is done on hydraulic components, transmissions and torque converters. Our shops are responsible for the teardown, inspection, resealing and testing of all hydraulic cylinders. This department also performs barrel salvaging. In this function, lite honing is performed, oversizing up to .060" is performed for salvaging, honing could be performed to 18" diameter and up to 12' feet in length. Barrel Cleaning to prevent contamination and high pressure testing is done to assure quality control. Another valuable service provided is selective plating. It is a process that involves the use of different chemicals and electricity to repair gouges and scratches on the hydraulic cylinders or any other hard surface. The build up material is copper and the plating material is cobalt. 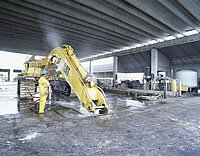 The Utility Shop is responsible for the track repairs, paint shops and the wash rack. In the track shop, 2 presses, a 310-ton and 350 ton press, are used to perform track link repairs, rebuilds and pin and bushing turns. 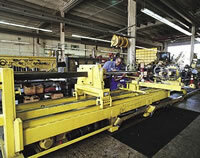 Roller and idler assemblies are rebuilt in specialized areas. The Weld shop and fabrication services include stick, MIG and TIG welding. 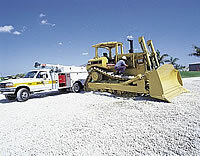 This is performed on a day to day basis to repair and rebuild machines and attachments. Line boring, which restores the bores of the components that have been worn with use, is a daily and common procedure that our welders have mastered. This service can be performed in the shop or on site . We have the capability to linebore from 1 Â½" to 14" size holes. 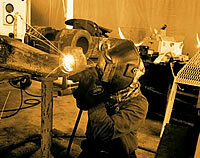 Our field welders have worked in many harsh and difficult environments. There are currently four welders in this department that are AWS (American Welding Society) certified. This department also performs welding services on other makes and brands of equipment. The Field Service Department is responsible for diagnosing and repairing machines and performing scheduled maintenance on your CAT Heavy Equipment at your job-site. All Kelly Tractor Co. field technicians are equipped with cell phones and digital pagers to be on call 24 hours a day, 7 days a week. Laptops are used to diagnose CAT machines with on board computers and allow our techs to use ET (Electronic Technician) in the field. Kelly Tractor Co. has the ability to perform oil sampling, from the machines both in the shop and field, which enables us to predict and determine the early stages of machine wear or breakdown. 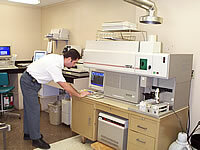 The Fluid Analysis Lab, located on premises of the Miami Service Department has the ability to perform wear element analysis, particle count and infrared analysis. By being able to analyze the different types of metals within the oil sampling, it is possible to determine if a problem is imminent. This lab also performs water and glycol detection and testing for fuel dilution. Results are available within 24 hours with an evaluation and recommendation. The lab has 25 years of experience in performing this service and has state of the art instruments and equipment. The lab also does coolant analysis, which is so important in our hot climate. Kelly Tractor Co. also strongly believes in and offers a variety of Preventive Maintenance Service plans for their customers. Currently, the company has Customer Service Agreements (CSA) department in Miami and the Service Department staff has the ability to quickly quote customers company wide. Some of the other Preventive Maintenance Service plans being offered now are Custom Hydraulic Service (CHS), Technical Analysis (TA), and installation of Prelub Starters. We have 6 mobile Preventive Maintenance Lubrication field service trucks companywide and employees that perform these services at the customers place of business, or equipment job site. Two lube trucks and a third lubrication truck is in the design process to handle this fast growing business.